I'm gonna have to take advantage of the "catch-up" offer he's proposing on the SSM Forum... I already have two of the bridges. Just ordered one "catch-up" set via email offer from Tetryon Parts. Unlike the TOS model, the 1/1000 Refit has a lot of details and angles that would be (and were) easy to get wrong. It's subtle stuff--but the slightly-off-looking bridge, engines, etc. detract from the overall look of the stock kit. The blog is updated with my work on the second pilot model. Now...*gulp*...just have to start work on the production version! Updated the blog with annotated photos which detail all of the differences between the two pilot versions of the Enterprise. Can't tell ya how satisfying it is to have been so successful with this project--so far. The production version is the one this has all been building up to. Haven't received the aftermarket Refit parts, yet, but looking forward to it. Just received the parts! They're great! I'm amazed at how much detail is there, for such small areas. Got mine today as well. The impulse deck is great! The torp launcher has some flash that'll need to be cleaned up. Still trying to figure out the "cut at 45 degrees" instructions to removing the kit's torp launcher... Won't that remove too much material from the neck? Started preliminary clean-up work in preparation for building my production-era model. It's gonna be a while. I want to do more heavy research before getting too deeply into it, and now the weather is becoming not very conducive for painting. But the blog has been coming along. Almost 600 views and one(!) comment, but people seem to like it, based on what they're saying in various forums. That's the idea, after all--a one-stop shop for everyone on how to superdetail one of these kits. 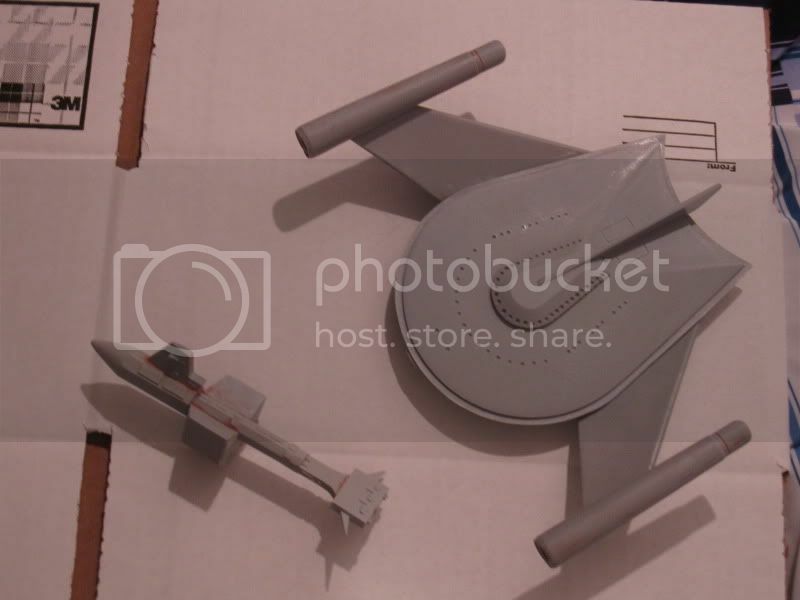 Round 2 has announced at the iHobby show that in early 2011, they will repop the TOS Klingon Battlecruiser. There will also be a glow in the dark version of the TOS Enterprise kit with decals as The Defiant from the Tholian Web episode, along with some new little Tholian ships to go with it. Previously announced, the TOS Romulan Bird of Prey will be repopped in November, and the Abrams-prise is scheduled for April 2011. All these kits are available for ordering at your LCS via Diamond. The one that everyone seems to want is the 1/350 TOS Enterprise to go along with the 1/350 1701-A, but there's been no news for many months. It seems to be pretty much one repop after another. Hope they sell well, though! Maybe that will get some new kits in the pipe. I'm hoping for at least a 1/1000 K'Tinga battle cruiser sometime in the future... Need a Kronos One to go with my 1071-A. Round 2 has been taking heat on internet message boards the last few days for their lack of any new Star Trek kit announcements at iHobby. They got the licence in summer 2008 and announced an Akira would be their first kit. In the summer of 2009, they announced they had changed plans and would have a 1/1,000 Enterprise-A in stores by December as their first kit, and then a 1/2,500 Abramsprise out in 2010. 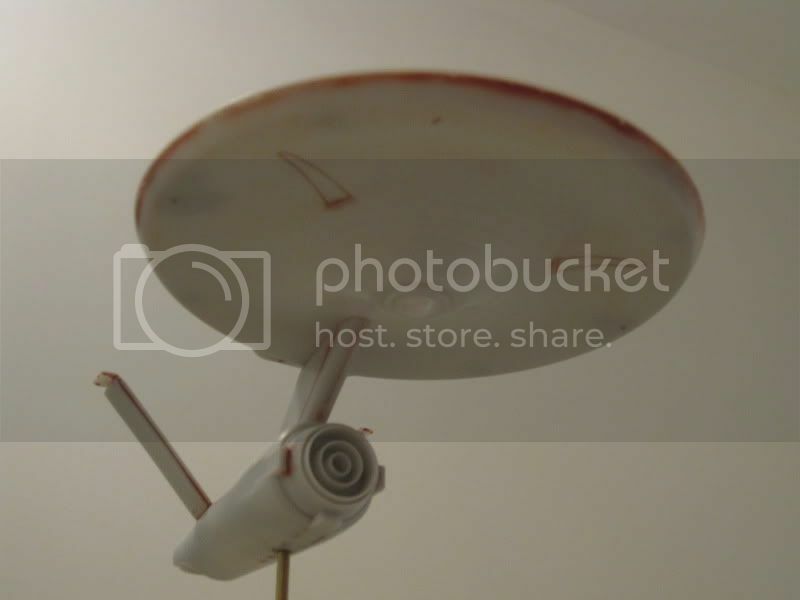 The Enterprise-A didn't show up until April 2010, and the Abramsprise is now scheduled for April 2011. When asked at iHobby about a 1/350 TOS Enterprise, Round 2 said that while it is next on their list after the Abramsprise, they could not guarantee it would ever get the green light because of the high cost of tooling such a large kit. This of course begs the question of what they will do after the Abramsprise if they decide not to do a 1/350 TOS Enterprise. The only sure bet seems to be that there will be a long period of silence on new kits after the Abramsprise, no matter what. I am glad that Round 2 is repopping so many old Star Trek kits, but I am equally frustrated at their inability to make new kits. They are sitting on a licence that another company like Moebius could be doing more with, e.g., Moebius puts out its second Battlestar kit in November, and kits #3 and #4 are announced and scheduled. Started preliminary construction on my production model. Round 2 has begun soliciting preorders for the 1/350 TOS Enterprise (a premium version for $150, with a standard version presumably to follow after that), even though there's been no official announcement that it will be produced! I decided to pick up Acreation's TOS saucer grid decals, so as to have the option of not drawing the bloody thing on myself! We'll see if I end up using it. 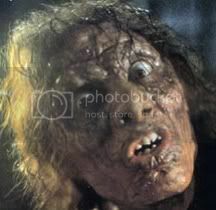 Heck, the grid is somewhat controversial in modeling circles. Some people think it was never there during TOS (it was) while others think it shouldn't have been on there at all, and prefer a "clean" saucer. Greg, I see that you've filled in the saucer landing ramps (?) on the underside... Are those more molded details that are inaccurate, or just laying the groundwork for the Acreation decals? The etched lines were not on the real, 11-foot model--just markings. I'm filling the incorrect etched lines that were represented on the real model by paint or markings on the dorsal, nacelles, and lower saucer. The Acreation set does not include the "landing leg" markings, but the PNT set does. I've left the raised rib at the base of each intact, and will use the decals for the markings. I received the Acreation saucer grid decals the other day. It's nice and subtle--I think I'll use it, with a bit of the base color misted over it to help blend it in. I also ordered a spare. At the very least, I'll need to trim some extra elements to use for the radial lines running along the saucer edge, which are not included--just the upper and lower saucer's grids. Because I'm taking my production Enterprise nice and slow, I decided to work on a few side projects--the Polar Lights Klingon Battlecruiser, and garage kits of the Botany Bay and Romulan Bird of Prey, both in 1/1000 scale. Received the latter two just recently, and began work on them. They're great! Interestingly, the BOP has a number of details that seem to come from the McMaster plans (such as the impulse engines on the rear of the main hull and the missile tubes on the nacelle pylons). My research indicates that the long-lost original model from TOS didn't have these details, so I'm removing them. I prefer the more austere look, anyway. So, I'm having fun with these non-Enterprise models--it's good to try something new! The Botany Bay model is pretty good out of the box, but is missing a few details (which I added with bits of styrene), and doesn't have the rods which extend from the rear hull to the solar panel thingies. So, I carefully took some tiny brass rods, and JB-Welded (no relation to our JB) them to the triangular rear hull extensions and the solar panels. It's fragile, but seems secure. Greg, this is the kind of thing you'd know off the top of your head...was the Botany Bay a Matt Jefferies design? Yes. Jefferies designed the Enterprise, Klingon D-7, Botany Bay, and basically every other ship and environment seen in TOS. The Romulan Bird of Prey was designed and built by Wah Chang, however. Many of Jefferies' sketches for the "antique spacefreighter" that would become the Botany Bay are available both in print and online. 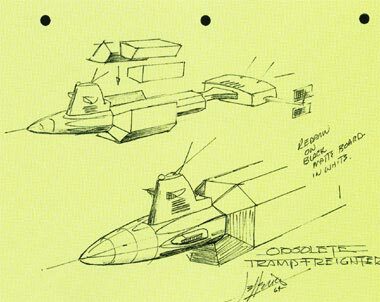 It seems he really liked the "conning tower" and the modular cargo pods, since they appear in many of his sketches and designs. Thanks, Greg. I had vaguely recalled reading that there was a ship or two in TOS that Jefferies hadn't designed; perhaps I was thinking of the Bird of Prey. I've always thought that the conning tower you mention was a nifty touch. There's no reason an interplanetary spacecraft would need a conning tower like a submarine, of course--but the way the Botany Bay sort of echoes a submarine somehow makes it feel like a plausible piece of near-future engineering...and, when placed next to the far-more-graceful Enterprise, it instantly testifies to the progress made between Khan's time and Kirk's.